One of Edward A. Lee's main topics in his book, Plato and the Nerd: The Creative Partnership of Humans and Technology (MIT Press, 2017), is the contradistinction between science and descriptions on the one hand and engineering and prescriptions on the other hand. Reading between the lines, Lee is addressing the big question: Is computer science really a science? We can make definitive statements about models, from which we can infer properties of system realizations. The validity of this inference depends on model fidelity, which is always approximate. These 2012 words beg the question: How to get a good model fidelity? Lee addresses this question with several insightful examples in his 2017 book. My interest lies in Lee's distinction between two mechanisms on how to use models: the Scientific Mechanism and the Engineering Mechanism [12, p.42]. I shall now elaborate on Lee's two mechanisms. The bold-faced names are of my choosing and so are several examples. The Scientific Mechanism amounts to choosing a model that is faithful to the modellee. A scientist will study nature and subsequently choose or invent a model that s/he deems is useful. For example, the laws of classical mechanics (= model) are an attempt to capture and predict motions in our physical world (= modellee). The world is given and the model is of the scientist's making. The Engineering Mechanism amounts to choosing or producing a modellee that is faithful to the model. For example: a construction engineer uses a blueprint (= model) as a guide to construct a building (= modellee). Another example: a software engineer uses a flowchart (= model) to produce a computer program (= modellee), as explained in my post on flowcharts. Does a computer scientist work (mostly) in compliance with the Scientific Mechanism or (mostly) with the Engineering Mechanism? With regard to theoretical computer scientists, and complexity theorists in particular, a similar story is told by Michael Mahoney  — where, for example, the linear bounded automaton was (at some point and by some actors) considered less baroque than the Turing machine in order to mathematically capture physical computations. So, also theoretical computer scientists sought mathematical models in compliance with the Scientific Mechanism. I refer to my second oral history with Knuth  and also to my latest book  for more coverage. Of course many historical actors were and many contemporary actors are both scientists and engineers — a point that also Lee makes in his book. In my opinion many computer scientists are more software engineers than they would be willing to admit. This brings me to yet another theme in Lee's book, which I only mention in passing: traditionally, engineering is less respected than science. (And several engineers — as Lee illustrates — have advanced science.) Related remarks about the tendency to place mathematical rigor above all else have been made by Walter Vincenti , Peter Naur , Michael Jackson , and others. The Scientific Mechanism amounts to choosing a good description. A description is an account of some event. An example of a description is (a textual representation of) the second law of thermodynamics. The Engineering Mechanism amounts to abiding by a prescription. A prescription is a recommendation that is authoritatively put forward. An example of a prescription is a blueprint (printed on paper) of a building. Why many computer science courses contain the words “Turing machine” and “Chomsky hierarchy” and the like. Why many software engineering courses hardly if at all rely on the “Turing machine” concept. It simply does not make much sense to use a Turing machine as a prescriptive device in the world of software engineering (although there are exceptions). I was initially trained as a software engineer (1995-2000) and as a student I only came across the words “Turing machine” in an appendix of a book on code theory(!) Times have changed for software engineering students at my local university (KU Leuven) for now they follow a course on computability theory. Of course curricula are different across countries and continents; nevertheless, I don't think my personal experience is too far off from that of many fellow software engineers of my generation or before. Take Dave Parnas for example. He told me that he did learn a lot about Turing machines but primarily (if not solely) from Alan Perlis, a computer scientist of the first hour (not to mention that Perlis was the very first Turing Award winner). Moreover, my educated guess is that Parnas does not consider Turing machines to be central to his profession [18, p.26-28]. But now irony sets in because I will try to show that, in accordance with the two above-stated mechanisms, Parnas was more of a computer scientist than Edsger Dijkstra, and Dijkstra was more of a software engineer than Parnas. To convey this message I will first zoom in on a fundamental problem in computing. A “computer programmer” need not be a computer scientist nor a software engineer. Similar criticism has been conveyed by Niklaus Wirth [4, Ch.5] and Michael Jackson . Naur says that if a software company loses all its programmers, then it better rebuilds its software from scratch (with a new team of programmers). All existing code and documentation will be of little value to other experts . See my previous post for some useful functions that are not necessarily describable. The emphasized words, attributed to Harold Garfinkel [8, Ch.1], are akin to the views put forth by Naur and Lee. (Am I exaggerating if I interpret the previous passage as an alternative formulation of the Kopetz Principle, which — once again — states that the model fidelity is always approximate and, thus, that the model is irremediably incomplete?) Concerning the term “instructions” in the previous quote, think about the instructions that somebody gives you to go from point A to point B. Alternatively, and more in connection with Parnas's and Naur's writings, think of the instructions (e.g. software requirements, formalized specifications, program text, sequence diagrams, ...) that you, as a novice programmer in a software company, need to examine in order to (allegedly) be able to grasp all the technicalities of the software project at hand. As we shall see later, Parnas said in 1985 that achieving such insight from documentation alone is feasible in principle. Naur, in contrast, said that human involvement remains key; that is, good documentation and code only get you so far. In sum, both Parnas and Naur criticized the programming methodology work of Dijkstra et al., but Naur went a few steps further. A synthesis is starting to emerge as I write these posts on Lee's 2017 book and the history of formal methods in computer science. Observe, for instance, that Parnas's “faked” approach amounts to choosing a good description of the prior, irrational software-design process, conducted by humans. Parnas thus advocated the Scientific Mechanism, believing that it is possible to obtain a rational and complete description of a real-life software-engineering event. Dijkstra with his prescribed top-down programming methodology, in contrast, followed the Engineering Mechanism more than Parnas. The irony is that Parnas will be remembered as a software engineer pur sang, and Dijkstra mostly as a computer scientist (instead of the other way around). With that said, and as I've discussed before, Dijkstra and Hoare did call themselves “software engineers” in the 1960s and 1970s — an observation that is now starting to make more sense (to me). Parnas said that the we can get an accurate description of the software-design process (cf. the Scientific Mechanism), not a perfect prescription. Naur said that we can't even get an accurate description. I take both Lee's and Suchman's philosophies to align quite well with Naur's views. Dijkstra and Hoare, in turn, were much more receptive to the idea that we can get a rational and complete prescription; that is, a recommendation that is authoritatively put forward on how to rationally develop “correct-by-construction” software (cf. the Engineering Mechanism). There is of course much more to be said. Lee, Naur, and Suchman are only three of many proponents who strive for a creative partnership of humans and technology without equating one with the other. M. Bullynck, E.G. Daylight, and L. De Mol. Why did computer science make a hero out of Turing? Communications of the ACM, 58(3):37-39, March 2015. T.R. Colburn. Philosophy and Computer Science. M.E. Sharpe, 2000. E.G. Daylight. Pluralism in Software Engineering: Turing Award Winner Peter Naur Explains. Lonely Scholar, 2011. E.G. Daylight. 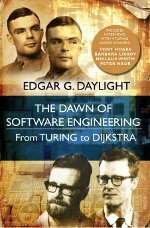 The Dawn of Software Engineering: from Turing to Dijkstra. Lonely Scholar, 2012. E.G. Daylight. Towards a Historical Notion of `Turing the Father of Computer Science'. History and Philosophy of Logic, 36(3):205-228, 2015. E.G. Daylight. 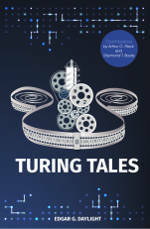 Turing Tales. Lonely Scholar, 2016. E.G. Daylight, A. Vandecappelle, and F. Catthoor. The formalism underlying EASYMAP: a precompiler for refinement-based exploration of hierarchical data organizations. Science of Computer Programming, 72(3):71-135, August 2008. H. Garfinkel. Studies in ethnomethodology. Englewood Clifs, NJ: Prentice Hall, 1967. M.A. Jackson and E.G. Daylight. Formalism and Intuition in Software Development. Lonely Scholar, August 2015. D.E. Knuth and E.G. Daylight. 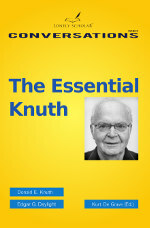 The Essential Knuth. Lonely Scholar, 2013. D.E. Knuth and E.G. Daylight. 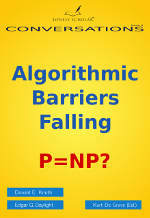 Algorithmic Barriers Falling: P=NP? Lonely Scholar, 2014. E.A. Lee. Plato and the Nerd: The Creative Partnership of Humans and Technology. MIT Press, 2017. D. MacKenzie. Mechanizing Proof: Computing, Risk, and Trust. MIT Press, 2004. M.S. Mahoney. Histories of Computing. Harvard University Press, 2011. P. Naur. Programming as theory building. Microprocessing and Microprogramming, 15:253-261, 1985. P. Naur. Computing: A Human Activity. ACM Press / Addison-Wesley, 1992. P. Naur. Knowing and the Mystique of Logic and Rules. Kluwer Academic Publishers, 1995. D.L. Parnas. Software engineering programs are not computer science programs. IEEE Software, 16(6):19-30, 1999. D.L. Parnas and P.C. Clements. A rational design process: how and why to fake it. In H. Ehrig, C. Floyd, and M. Nivat, editors, TAPSOFT Joint Conf. on Theory and Practice of Software Development, Berlin, March 1985. Springer-Verlag. L.A. Suchman. Human-Machine Recongurations: Plans and Situated Actions. Cambridge University Press, second edition, 2007. M. Tedre. The Science of Computing: Shaping a Discipline. Taylor and Francis, 2014. W.G. Vincenti. What Engineers Know and How They Know It: Analytical Studies from Aeronautical History. Johns Hopkins University Press, 1990. Is your drone Turing complete? J. Kemeny. Man Viewed as a Machine.